Amazon UK has put the Samsung Galaxy Tab up for sale ahead of its launch next month – at a whopping £799. 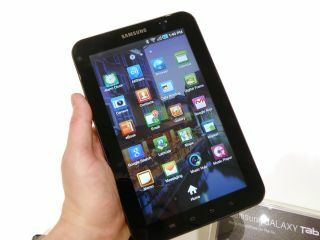 The 'Samsung P1000 Galaxy Tab Smart Media Device' is listed with a 1GHz processor, 7-inch LCD screen, Bluetooth 3.0 and Android 2.2, although no UK release date. Given that these are all specs found in the average mobile phone (the 7-inch screen aside) it's truly hard to see where the cost hikes are coming for the new Samsung Galaxy Tab. Other sites, such as Clove, are listing the Galaxy Tab for a lower-but-no-less-palatable £615 price point, and Samsung confirmed to TechRadar recently that the post £600 price point is indeed genuine, although it may change before launch. Apple's iPad, by comparison, costs up to £699 – but that's with 64GB of flash memory and a 10-inch screen... and it's made by Apple, so you can see where all the cost hikes have come in. Either way, it's hard to see how Samsung hopes to make the Galaxy Tab competitive unless some networks are planning to offer huge subsidies on a very long-term contract, as otherwise this new device is going to barely register in the fight against the iPad. Thanks to Matthew for the tip!